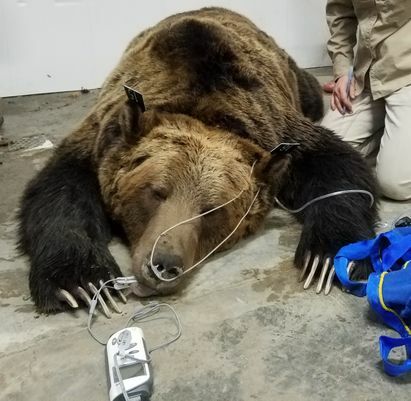 An article on the Great Falls Tribune site by Jo Dee Black stated that a large grizzly bear was captured inside the garage of a Hutterite family near Valier, Montana. Yelling, mace spray and honking didn’t coax a 900-pound male grizzly bear out of an open garage building Wednesday at the Birch Creek Hutterite Colony southwest of Valier. So the colony members called the bear management specialists from Montana Fish Wildlife and Parks. “They said the bear wasn’t causing problems, it was just in the wrong place at the wrong time,” said Wesley Sarmento, of FWP. The bear ducked into the building in an attempt to get away from the people trying to haze it away from the colony. It apparently took six people to move the bear after it was tranquilized. To read the full article in the Great Falls Tribune, click here.